Cost-push inflation is when supply costs rise or supply levels fall. Either will drive up prices as long as demand remains the same. Shortages or cost increases in labor, raw materials, and capital goods can create cost-push inflation. These components of supply are also part of the four factors of production. Cost-push inflation can only occur when demand is relatively inelastic. That's when people still buy the good or service even if the price goes up. For example, inelastic demand occurs with gasoline. 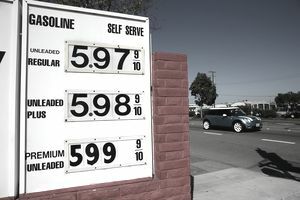 People can't easily buy less gas no matter how high the price goes. It's even worse for those who don't have good alternatives, such as mass transit. It takes time for people to find alternatives, such as joining a carpool or buying a fuel-efficient vehicle. Until then, they need the same amount of gas. Cost-push inflation is rare. It only occurs under five special circumstances. In all of these circumstances, demand is inelastic. Companies that achieve a monopoly over an industry can create cost-push inflation. A monopoly reduces supply to meet its profit goal. A good example is the Organization of Petroleum Exporting Countries. It sought monopoly power over oil prices. Before OPEC, its members competed with each other on price. They didn't receive a reasonable value for a non-renewable natural resource. OPEC members now produce 42 percent of oil each year. They control 80 percent of the world's proven oil reserves. OPEC members created cost-push inflation during the 1970s oil embargo. When OPEC restricted oil in 1973, it quadrupled prices. In 2014, shale oil producers challenged OPEC's monopoly power. Prices dropped as a result. They created a U.S. shale oil boom and bust. Wage inflation occurs when workers have enough leverage to force through wage increases. Companies then pass higher costs through to consumers. The U.S. auto industry experienced it when labor unions were able to push for higher wages. Thanks to China and the decline of union power in the United States, it hasn't been a driver of inflation for many years. This is sometimes called wage push inflation. Natural disasters cause inflation by disrupting supply. A good example is right after Japan's earthquake in 2011. It disrupted the supply of auto parts. It also occurred after Hurricane Katrina. When the storm destroyed oil refineries, gas prices soared. The depletion of natural resources is a type of natural disaster. It works the same way, by limiting supply and causing inflation. For example, fish prices are rising due to overfishing. Recent U.S. laws try to prevent it by limiting the catch for fishermen. A fourth driver is government regulation and taxation. These rules can reduce supplies of many other products. Taxes on cigarettes and alcohol were meant to lower demand for these unhealthy products. That may have happened, but more importantly, it raised the price and created inflation. Government subsidies of ethanol production led to soaring food prices in 2008. Agribusinesses grew corn for energy production, taking it out of the food supply. Food prices were so high that there were food riots around the world that year. The fifth reason is a shift in exchange rates. Any country that allows the value of its currency to fall will experience higher import prices. The foreign supplier does not want the value of its product to drop along with that of the currency. If demand is inelastic, it can raise the price and keep its profit margin intact. Cost-push is one of the two causes of inflation. The other is demand-pull inflation. It is the most common cause of inflation. It occurs when the aggregate demand for a good or service outstrips aggregate supply. It starts with an increase in consumer demand. Sellers try to meet the higher demand with more supply. If they can't, then sellers raise their prices. Expansion of the money supply is another cause of inflation. That's when the government prints too much money. That has happened in the past to cause hyperinflation. It is one of the four types of inflation. The other three are creeping, walking, and galloping. Expansion of the money supply also occurs when a nation's central bank expands bank credit. It usually does this by lowering interest rates.